The 1923 Stanley Cup Final was contested by the NHL champion Ottawa Senators and the WCHL champion Edmonton Eskimos. The previous WCHL-PCHA playoff format was abandoned, and the Ottawa Senators now had to play first the PCHA champion Vancouver Maroons, followed by the WCHL champion Edmonton Eskimos in the Final. All games were played in Vancouver. n the first game, Edmonton was leading 1–0, on a goal by Crutchy Morrison, before Lionel Hitchman scored in the third period to tie the game. Duke Keats of Vancouver was awarded a penalty shot during the game, but failed to score. Cy Denneny scored after two minutes of overtime to win the game for the Senators. In the second game, the Senators got a first period goal from Harry Broadbent and made it stand to the end of the game, playing six-man defense. The shots were recorded; 21, 14 and 13 for a total of 48 by the Senators, and 25, 18, and 25 for a total of 68 by Edmonton. Several players could not play the whole game, including Eddie Gerard and Georges Boucher. Lionel Hitchman played the game with his broken nose in a plaster. Harry Helman played despite a cut to his face from Frank Nighbor's skates, incurred in practice. Cy Denneny had been cut in the leg by the skate of Vancouver's Smokey Harris. 'Super-sub' King Clancy took a turn in all positions, including goal for Clint Benedict in the third period for two minutes when Benedict was serving a penalty. At the time goalies had to serve their own penalties. This is only time that a player played all six positions in a Stanley Cup Final game. 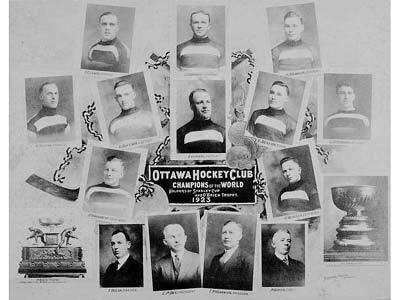 The 1922–23 Ottawa Senators season was the club's 38th season of play and sixth season in the NHL. They were coming off a disappointing playoff run in 1922, as they lost to the Toronto St. Pats in the NHL finals in a close, hard fought series. The Senators would finish first in the standings, defeat Montreal in the playoffs, defeat Vancouver in the Stanley Cup semi-finals and defeat Edmonton to win their 10th Stanley Cup title. In the NHL finals, the Senators would face the Montreal Canadiens in a two-game total-goals series to determine the O'Brien Cup winner, and the Sens would prevail by a close 3–2 score in the series, and go on to face the Vancouver Maroons, the host team from the PCHA. The Senators returned home on Friday, April 6, 1923 from Vancouver. Greeted by Ottawa Mayor Plant, and accompanied by the Governor-Generals Foot Guards and the Ottawa Silver Band, the team paraded through Ottawa's downtown streets. A banquet was held for the team on Monday, April 19, where each of the ten team members received a gold watch. According to Mayor Plant, "this is a citizens' banquet, not a civic one, as the citizens believe you have given Ottawa the best advertising it has ever had. This year was the first time in NHL history that brothers faced each other in the Stanley Cup final. But not just one set of brothers--two! Cy and Corb Denneny as well as George and Frank Boucher faced off in game one. This was a gruelling series, but Ottawa defeated the Vancouver Maroons three games to one. The Sens Harry Broadbent scored five goals in the series to lead Ottawa. Three days after disposing of Vancouver, the Senators took on the WCHL champions from Edmonton. Ottawa won both contests by one-goal margins. After their letdown in the playoffs the Senators rebounded, as they stormed out of the gate on the way to finishing first overall in the league again with a stellar 14-9-1 record. Along the way they were undefeated on home ice, as Clint Benedict led the league for the 5th straight year in GAA. On the ice Cy Denneny dominated the Senators scoring 23 goals in 24 games; While King Clancy was an everyman man as he played all positions for the team this year even a brief stint in goal replacing a tired Benedict late in one game. In the playoffs the Senators defeated the Montreal Canadiens for the NHL championship 3-2 in a 2-game total goal series. With the NHL Championship the Senators now had to face 2 Champions for the Stanley Cup, the Vancouver Maroons from the PCHA as well as the Edmonton Eskimos from the new WCHL. The Senators would easily win both series wiping out the Maroons in 4 games of a best of 5 series, before sweeping the Eskimos in 2 straight to win the Stanley Cup for the 3rd time in 4 years.